With a forge handy, the knifemaker naturally progresses toward making pattern welded steel. 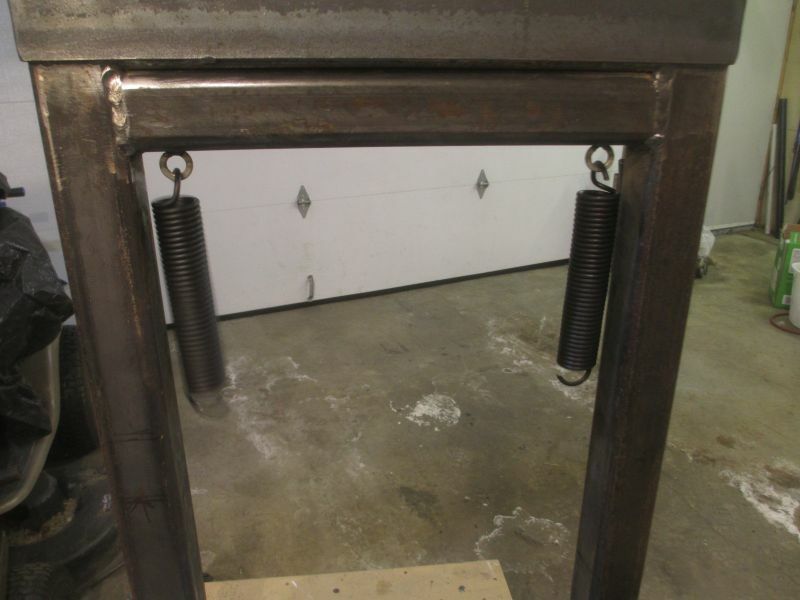 These billets are made from two or more types of steel and forge welded together. 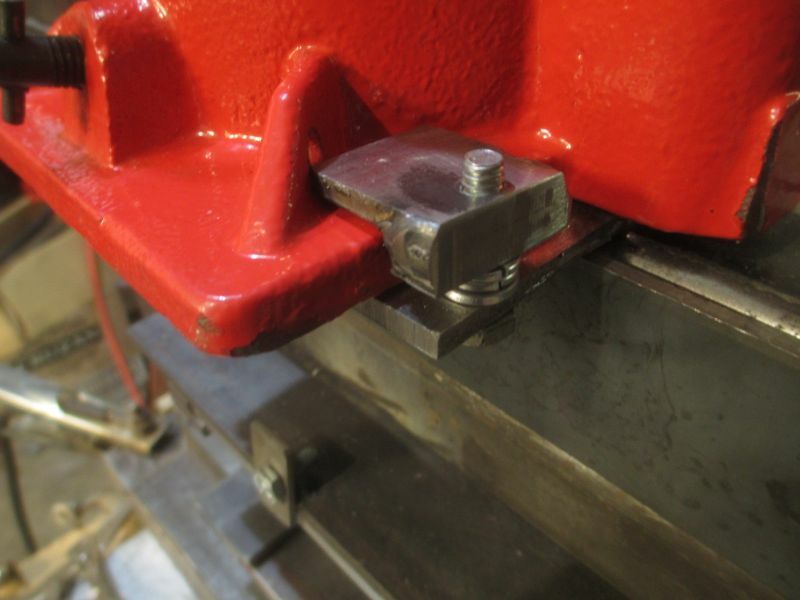 One tool that really helps pressing the steel is a hydraulic forging press. The real deal is very expensive and out of reach for the low budget guy like me, but there are ways to get the job done on a budget. Having seen T.A. Toler's design where he uses a relatively inexpensive 20 ton air actuated bottle jack and welded steel frame, I got to thinking that I could make some basic tweaks to his design and document it a bit. 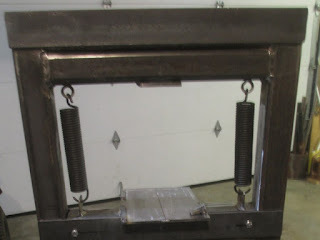 This press is by no means perfect, but it is a good solid unit made for a reasonably small chunk of loot. I made it with some material that I had in-house to save costs. The bottle jack is a generic 20 ton air actuated unit. Compressed air runs an actuator on the back of the jack that causes the ram to go up. While these types of jacks are slow and notoriously hungry for air, my goal is to get about five presses before having to put the steel back in the forge for reheating.While the steel is in the forge, the compressor can recharge the air supply and be ready for the next pressings. I went into this with a 120 psi 11 CFM air compressor system with an extra air storage tank in place already. Keep this in mind as most garden variety air compressors likely won't have enough capacity to happily run a press like this. The press needs to be small, sturdy and accommodate a few different types of dies to get a variety of tasks accomplished. Another feature I was aiming for was foot controlled operation. 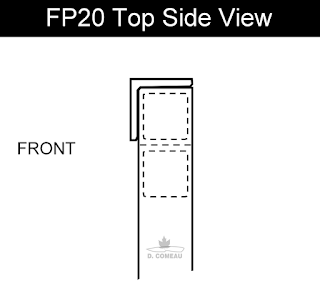 I want both hands on available for holding the billet when pressing. Unlike T.A. Toler's design, I wanted to place the jack on top. In this arrangement, the jack and associated air hoses are well out of the way of falling hot scale and anything that drops from the die area. Note: This information has been made available, free of charge, for educational purposes only. The author or publisher assumes no liability for the use or misuse of this information. 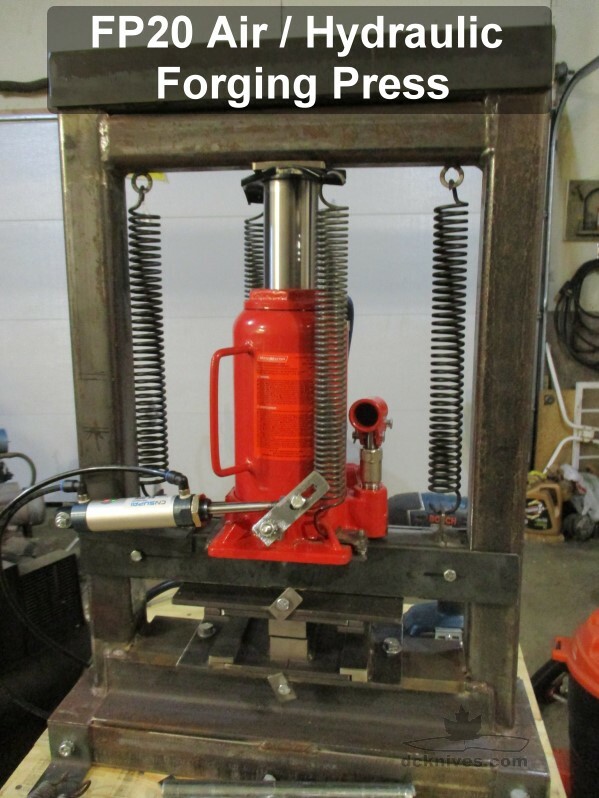 A hydraulic press involves extreme pressures that could be hazardous to your health. 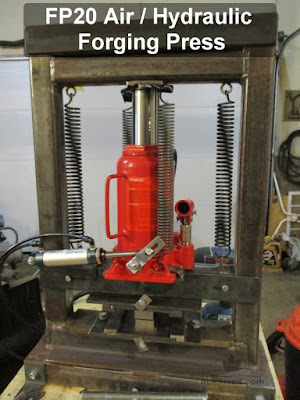 Basic operation of this press involves a hydraulic jack pushing the ram up and a handle of some sort to open the release valve causing the springs pull the ram back down. As I wanted to make this foot switch operated some additional controls were required. A simple two position foot switch would not work as this would mean the ram is either moving up or down. There would be no "stop" or "neutral" position where the ram stayed put. We certainly don't want the ram to move all the way back down each press as we'll be wasting a lot of time and a lot of air every press. I needed to find a way to make the ram stop when it's not explicitly commanded to go up or down. In trying to keep the design inexpensive and fairly simple, I went with two foot switches. Using one foot switch at a time means that only one action can be happening at a time. That is; one switch raises the ram and one that lowers the ram. The valve the came with the jack would be the raising valve and a 2 way 3 port foot pedal would run a double acting pneumatic cylinder to control the jack's release valve. 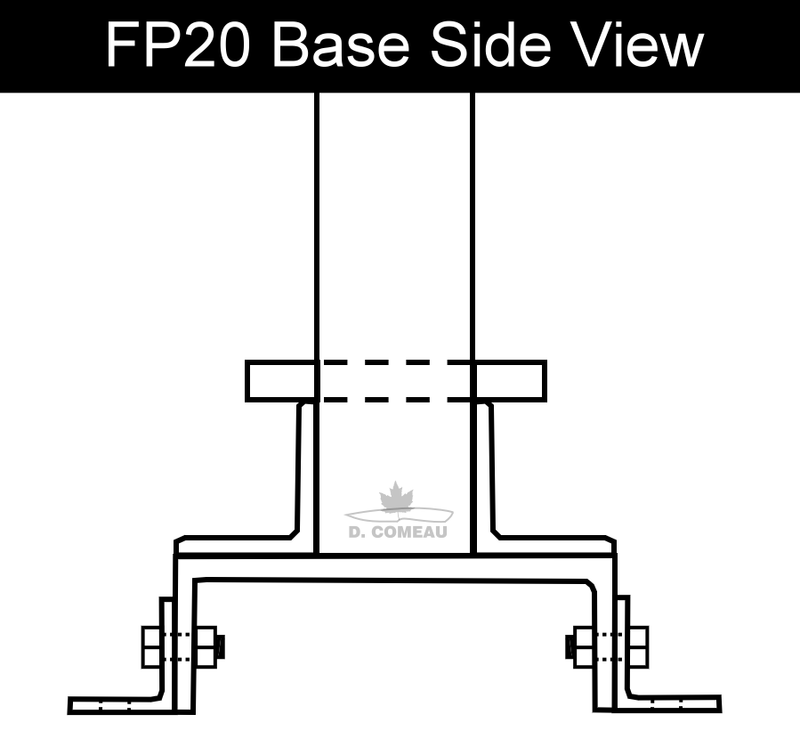 The frame of the press needs to be able to withstand 20 tons or 40,000 lbs of force without noticeable deflection. For the design I used 2" x 0.25" Hollow Structural Section (HSS). Based on the cross sectional area, two sections will have a yield strength of about 139,000 lbs calculated from a strength of 46ksi. This a safety factor of 3.5. Dies need to be inexpensive, quick to change and easy to replace if they become worn or fatigued. I chose a size of 5" x 5" for the die plates. However, 6" x 6" or 4" x 4" would also work. I wanted the dies to open at least 4 inches. If you were to start making large billets e.g. feather Damascus I may want to make the dies open to 6" or so choosing longer uprights may work better for you. All of the parts to make the press were sourced locally, with the exception of a few items I picked up on eBay and Amazon.com. 2" Square HSS (Hollow Structural Section) with a 1/4" thick wall. You should be able to get these from any local steel supplier. If you do not have a band saw, I'd suggest giving them a cut list and have them cut the pieces nice a square. 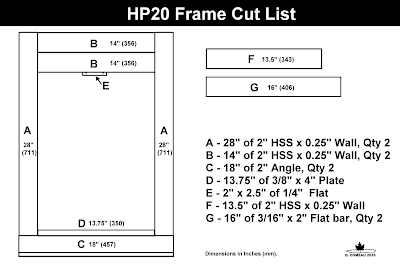 Square cuts are very important to ensure the frame is square. 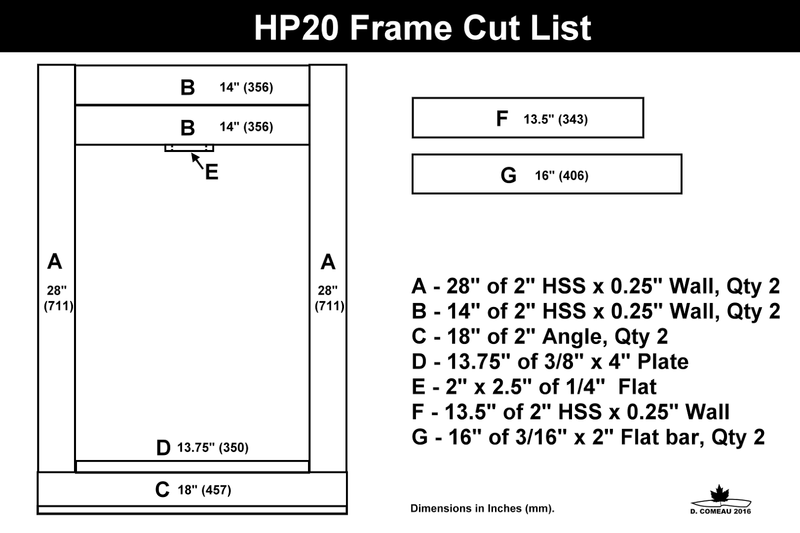 Not shown in this cut list diagram is the base. This can be anything flat and hefty. I had some 6" heavy C channel kicking around, but 8" C will work, as will some 1/4" plate, really anything solid for mounting the press to a bench. Die plates are 1/4" flat, 5" x 5"
Dies are whatever you want to place on the plates, but I would recommend for starters a drawing set made from 1 to 1-1/2" round bar and another flat set made from 1-1/2" flat stock. We'll look at the dies in further depth later on. 20 ton Hydraulic jack with air actuation. The jack will probably be the similar to every one I've seen, Harbor Freight etc. They are usually on sale for under $100. Mine was $89. They also come with a short section, (3 ft) of air hose and hand operated valve. Check to see that these are included as you'll want the valve. The jack comes with two springs, however two extra springs are recommended to speed up the retracting time of the ram. The auxiliary springs I used are 7" trampoline springs scavenged from the scrap yard. 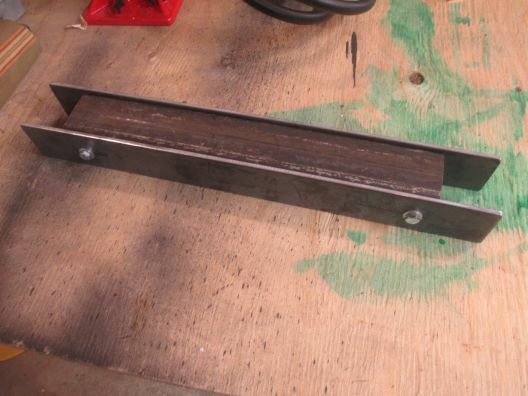 To build this press, you'll need some basic metal working tools. If you do not have a welder or are uncertain about your welding skills, then I strongly recommend that you enlist the services of an experienced welder. 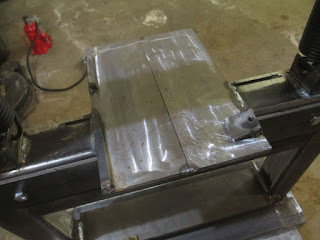 If you are going to weld it yourself, I'd recommend at least a 180 Ampere welder for 0.25" wall HSS steel. Disc grinder for cleaning up before welding. 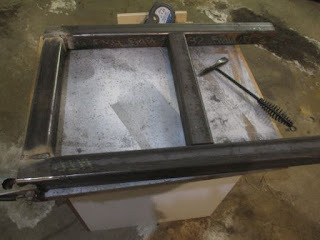 The frame pieces were cut on a band saw and cleaned and chamfered with an angle grinder. 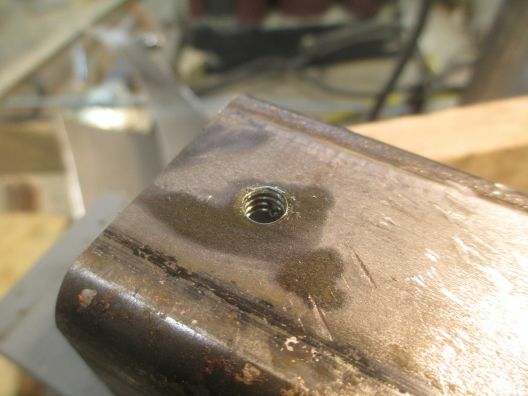 Using a magnet and square to check the pieces are set at 90°, tack weld them together. Again check the squareness and finished the welds. Using the second B 14" piece fitted between the uprights in order to keep them parallel during welding. 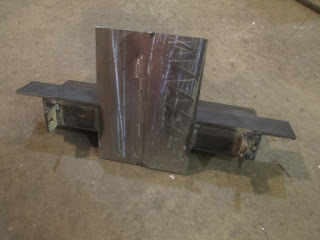 Eventually, I will weld this piece immediately underneath the top member to create a double top beam. The base consists of two pieces of C 2" heavy angle welded to a piece of 6" x 2" C channel. Additional mounting feet can be bolted or welded on from here. One piece of D is set on top of the angles and welded into place. Item D on my build is some 3/8" x 4" plate. 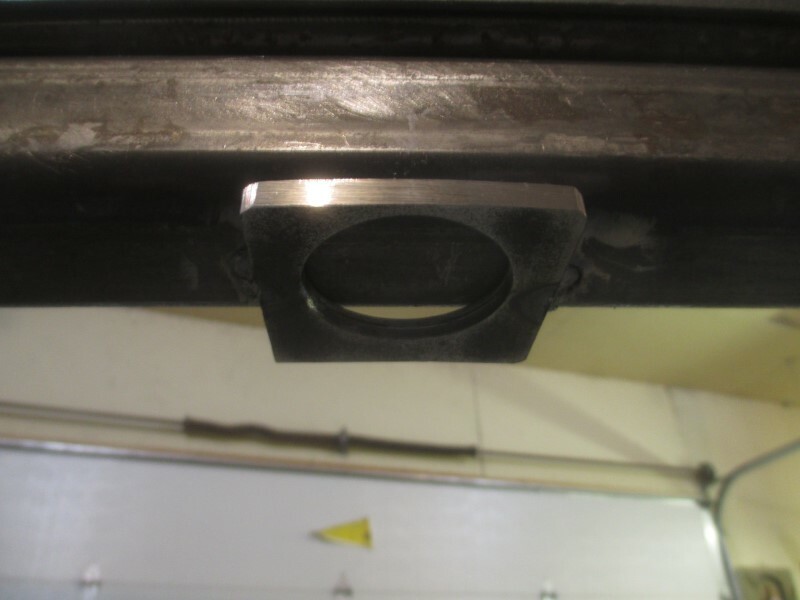 The uprights are capped with an optional 16" piece of 2" angle. This is only cosmetic to cover the open ends of the HSS uprights, so the gauge is not critical. It's also a great place to stick your logo! Here I have welded two 1/2" split ring lock washers to attached the secondary springs to the top of the frame. These springs work in conjunction with the springs on the jack to increase return speed. The last piece to be tacked on the crossmember is the jack's ram contact plate. This I made from 1/4" steel and cut a hole in it with a 1-3/4"hole saw. It is welded dead center on the crossmember. This guide ensures the ram won't slip off the crossmember. The upper anvil is the movable horizontal member F that is held captive by two pieces of G 3/16" steel. It sort of slides up and down the two uprights. As the main part of the upper anvil is a piece of 2" HSS, shown as part E. The bottom of the jack sits and is clamped to a base so it will move the anvil up and down. 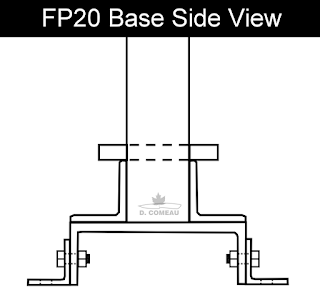 In addition to part E, two pieces of F (3/16" x 2" x 15" steel) keep it captive within the uprights. 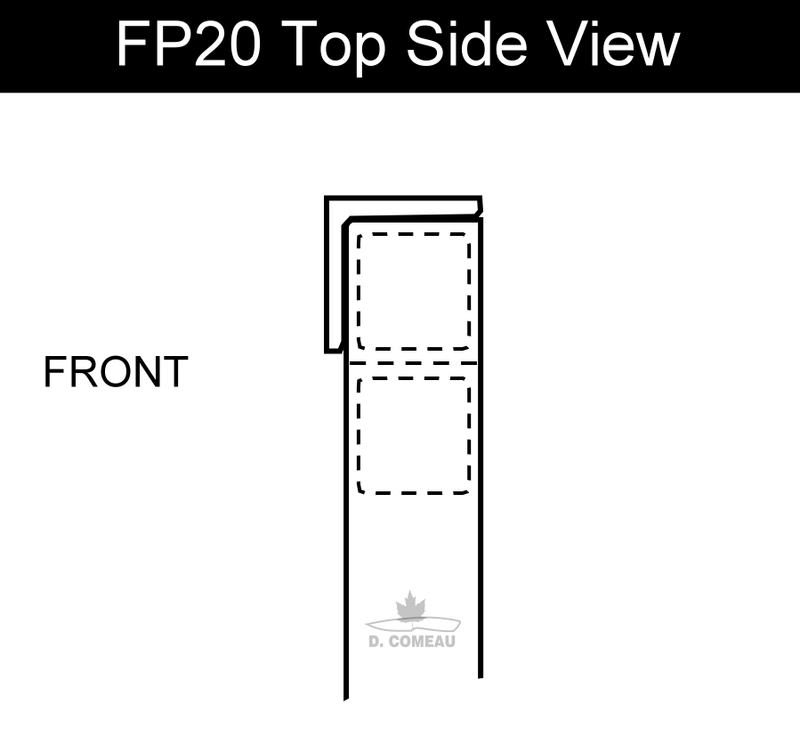 One piece of F is welded and the second F piece will be removable for service, so it is fastened with two 1/4" bolts. Clamp the 3/16" steel on to the 2" HSS and mark and drill two pilot holes 1" into the HSS. Using the pilot hole as a guide, drill 13/64" holes and tap with a 1/4 NC tap. Two 1/4" NC x 1/2" bolts secure the removable plate to the anvil. The jack base measures 6" x 9". I used two pieces of 3/16" x 3" and welded them to the HSS. Note that two pieces of 1" angle are drilled and welded to the top of the anvil to accept the auxiliary springs. Jack is ready to install. It takes a little bit of force to pull the springs down to get the fully retracted jack into place. This simple hold-down fixes the jack to the base. 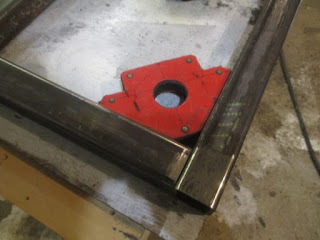 The washers are used to match the height of the jack base so the clamps more or less level when tight. In the next installment, we'll look at how the dies are made and fitted as well as the controls for running the air to the jack. small profile on myself..as an amateur living in Scotland i find it near impossible to source good tools at a reasonable/affordable price being the wright word so started making my own at an early age in the mid 70s would like too think i've got good at it but nothing like yourself.best wishes my fiend and keep up the good work. Great build. I'm in the process of building something similar. Have you finished part 2 yet. I'd love to see how you did it, but I don't see it on the site. Asking the same question as Bangalore... Also, if you have finished, how have you liked the result? Sorry guys. I have some pages close, but super swamped right now. I hope to get something up over the Christmas break when I will get a much needed few days off. Dan, it's a little on the slow side, but works well enough. My system could use more air capacity. 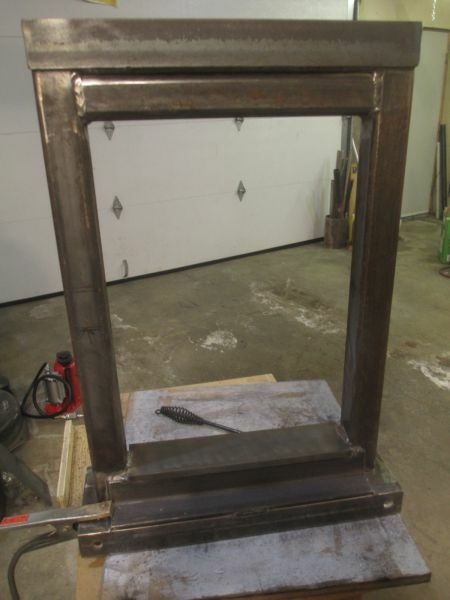 It is certainly not like a straight hydraulic press, but works good for the budget I am on. No worries, Dan, I know you have a zillion things going on. I want to start getting into pattern welded material for my knives in 2018 and was looking for something that wasn't a budget - or space - hog. I can be patient. Thanks! Hi Dan, Firstly thanks very much for posting all this fantastic information. I'm a hobbyist knifemaker in Calgary and am just finishing up building a 20-ton press, based on your design. I do have a couple of questions, firstly where did you get the return springs? I'm looking at using some trampoline springs but buying they are not cheap on Amazon. Secondly, what do you feel would be the minimum CFM and tank size for decent performance (3-4 presses per heat) for a unit like this? Hi James, based on my experience with the pneumatic/hydraulic 20 ton that I have I would recommend minimum 100 psi and 8 CFM or better. I have two compressors running in parallel to get some decent CFM and storage. If I recall correctly I have 17 gallons, a 10 gallon and a 7 gallon in tandem. On the bright side, while the piece is in the forge re-heating the air system can be charging up for use when the steel is hot again. se puede usar de 30 toneladas?